With just two months left before Mission: Impossible-Fallout skydives into theaters, Paramount has released the new full trailer and it's full of the insane stuntwork we've come to expect from Tom Cruise and Co. With the footage debuting at roughly 3am they need that kind of action to keep guys like me awake. Cruise's pal Christopher McQuarrie returns as director, but you'd never know it based on all the many ways he tried to kill him with some of these stunts. One, a skydiving spectacle over Paris, took over 100 takes and a year's worth of time just to figure out the logistics. Remember Cruise shattered his foot in one such action sequence, which set the film back nearly three months. 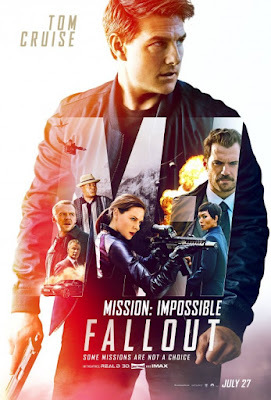 You can still see that bone-breaking scene in this trailer as Cruise's Ethan Hunt leaps from building to building after some impatient urging by Benji Dunn (Simon Pegg). Ving Rhames, Alec Baldwin, Rebecca Ferguson, Angela Bassett, Sean Harris, Vanessa Kirby, and Michelle Monaghan co-star, but it's the bruising Henry Cavill who looks like he may be more than a match for Cruise. Here is the synopsis: The best intentions often come back to haunt you. MISSION: IMPOSSIBLE – FALLOUT finds Ethan Hunt (Tom Cruise) and his IMF team, along with some familiar allies in a race against time after a mission gone wrong. Mission: Impossible-Fallout opens July 27th.